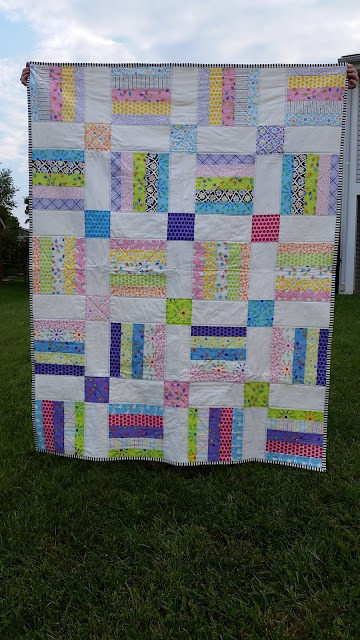 Kentucky Whittaker Creations: Jelly Roll Magic Quilt - Fun & Easy! I'm not one who likes to do a lot of cutting. I like simple designs. This quilt is fun and super easy. It uses a jelly roll, a charm pack, and some background fabric. And - it's perfect for the upcoming National Jelly Roll day! The Jelly Roll Magic Quilt was published on Moda Bake Shop in September 2017. The quilt is perfect for someone who is new to quilting or for the person who has some experience. It is one that can definitely be put together on a weekend. 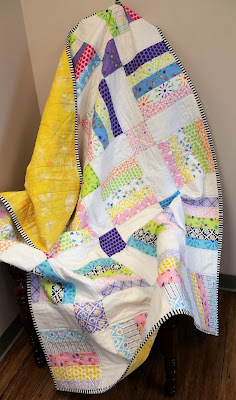 This quilt finishes at 53″ x 67″ - which is a perfect throw-sized quilt. Head over to Moda Bake Shop and check it out! Congratulations on your finish. Great use of precuts for a quick sew! I'm a fan of simple designs, too, Mona! What I especially like about this quilt is the deliberate placement of the higher-volume fabrics. The effect is subtle but draws the viewer's eye from top to bottom. Well done!